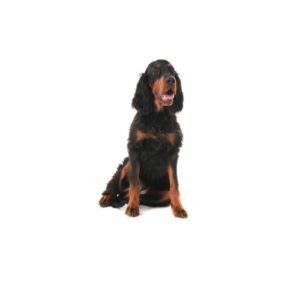 The heaviest of the three setter breeds, the Gordon Setter was originally bred as a personal bird dog, but they are equally at home as companion dogs, obedience competitors and show dogs today. Sturdy and muscular, the Gordon suggests strength and stamina rather than extreme speed while on the move. The breed?۪s distinctive black and tan coat allows it to be found easily in light fields and early snow. The Gordon hails from Scotland, and his ancient lineage traces back to the early 17th century. Popular among hunters of Scotland, the black-and-tan Setter came into prominence in the kennels of the fourth Duke of Gordon in the early 19th century. As field trials became more popular, the Gordon?۪s popularity waned in favor of Pointers and other flashy, fast breeds, but the breed remained unparalleled as a one-man shooting dog.